Aberdare National Park • Game Viewing from the Viewing Deck at The Ark. Lake Naivasha / Nakuru • Game Drives. Masai Mara • Game Drives. Lake Manyara • Game Drives. Ngorongoro • Game Drives.Any increase in the Airfare / Airline Taxes charged by the airlines on your air ticket(Calculated at 1st July 2016 rates). Tips of USD 3 per person per day for local guide and driver to be paid What your Tour Price does not include compulsory. On arrival into Nairobi you will be received by our representative and transferred to Aberdare National Park. On arrival at Aberdare Country you will check in and then be taken to Aberdare National Park. The Aberdare National Park, with an area of 767 Km2 covers the higher areas of the Aberdare Mountain Ranges of Central Kenya, from altitude of 1829M to 4001M above sea level. Animals easily observed in the park include the Black Rhino, leopard, baboon, black and white Colobus monkey and sykes monkey. Rarer sightings include those of lions, the golden cat and the bongo- an elusive forest antelope that lives in the bamboo forest. After a brief drive through the park we arrive at The Ark. Set in the heart of the Aberdare National Park, The Ark overlooks a floodlit waterhole and salt lick, which attracts a host of awesome wildlife. Modeled after Noah’s Ark, The Ark has four viewing decks with balconies and lounges to provide superb game viewing from the comfort of the lodge. The animals come to you! Overnight at The Ark in Aberdare National Park. Today, we check out of our lodge and drive to Lake Naivasha. Lake Naivasha is a freshwater lake in Kenya, fringed by thick papyrus. Afternoon wind and storms can cause the Lake to become suddenly rough and produce high waves. For this reason, the local Maasai christened the lake Nai’ posha meaning ‘rough water’, which the British later misspelt as Naivasha. The lake and its surrounds are rich in natural bounty, and the fertile soils and water supply have made this one of Kenya’s prime agricultural regions. Much of the lake is surrounded by forests of the yellow barked Acacia Xanthophlea, known as the yellow fever tree. These forests abound with bird life, and Naivasha is known as a world class birding destination.Later we take you for an afternoon Game Drive to Lake Nakaru National Park. Flanked by rocky escarpments, pockets of forest and at least one waterfall, the park is pretty yearround. You can expect to see both black and white rhino, baboons or perhaps a lucky leopard or two, apart from the usual zebras, buffaloes and Rothschild’s giraffes, Overnight at the lodge in Lake Naivasha. Today, sit back in your Safari Van and drive to the Masai Mara Game Reserve. We arrive at Masai Mara Reserve and check into your Lodge. Masai Mara is situated in south-west Kenya and is one of Africa’s Greatest Wildlife Reserves. Together with the Serengeti National Park in Tanzania it forms Africa’s most diverse, incredible and most spectacular eco-systems and possibly the world’s top safari big game viewing ecosystem. Made famous by the abundance of the big cats, Lion, Leopard, Cheetah and the Great Wildebeest Migration and the Maasai people, well known for their distinctive custom and dress. 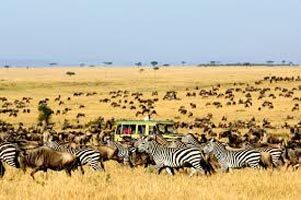 Maasai Mara National Reserve stretches 1,510 sq km (580 sq miles) and raises 1,500-2,170 meters above sea level. It hosts over 95 species of mammals and 570 recorded species of birds. In the afternoon, we take you on a game drive into the Mara Reserve. See the wildlife this Reserve is famous for - Gazelles, Antelopes and a variety of birds. The Lion, Elephant, Cheetah and Leopard can also be seen. Overnight at your lodge in Masai Mara. Today, we take you for an extensive game drive into the reserve. See Crocodiles and Hippos resting in the water. We return in time for a buffet lunch. Masai Mara is one of the best plains’ game reserve where you can actually encounter a live Discovery Channel, a haven for viewing a congregation of all sorts of animals in a five-mile radius: A pride of lions can be spotted ready to make a run for a gazelle, a cheetah and its cub taking a nap on a rock, a pair of ostriches walking the open stretches of the savannah or a gazelle giving birth The first sight of this natural wonderland is breathtaking. Here the great herds of shuffling elephants browse among the rich tree-studded grasslands with an occasional sighting of a solitary and ill-tempered rhino. In the Mara River, hippo submerges at the approach of a vehicle only to surface seconds later to snort and grumble their displeasure. Seemingly, the drowsy crocodile sunbathe on the riverbanks, mouth agape, waiting with subtle cunning for prey at which to strike with lightning swiftness. On an afternoon game drive deeper in the reserve, see herds of wild beasts, Elephants, Buffalos, Zebras, Rhinos, Leopards and the prides of Lions. Overnight at your lodge in Masai Mara. Today, after breakfast we check out and drive to Nairobi. Nairobi is the capital and largest city of Kenya. The city and its surrounding area also form Nairobi County. The name “Nairobi” comes from the Maasai phrase Enkare Nairobi, which translates to “cool water”. The phrase is also the Maasai name of the Nairobi river, which in turn lent its name to the city. However, it is popularly known as the “Green City in the Sun” and is surrounded by several expanding villa suburbs Overnight at your hotel in Nairobi. Today, we drive you to Kilimanjaro airport for our flight back home. Its time to say goodbye to all the new friends you have made. We hope you take back many happy memories of your SOTC holiday. We would like you to spare a few minutes of your time to write and tell us how you enjoyed your tour and any suggestions you may have for the future.